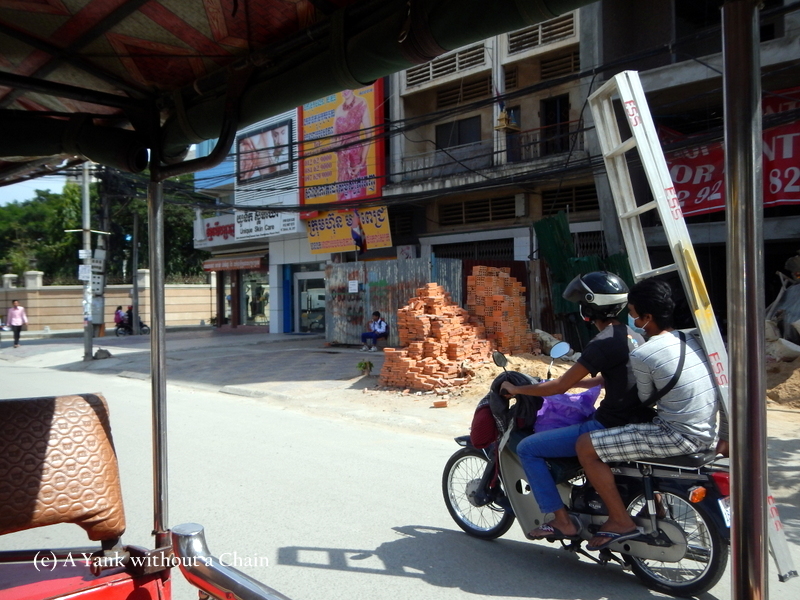 I spent 16 days in Cambodia and an average of $30 per day. I didn’t see too many places, just Banlung, Phnom Penh, Sihanoukville, and Siem Reap. The buses in southeast Asia were really wearing me down and I was concerned about my budget, so I decided to take it easy. I ended up spending more money than I had wanted to, though, mainly on the delicious western food I found near the beach. I don’t have a burning desire to return to Cambodia. I found the people there to be a bit too aggressive and untrustworthy. It’s not that I felt unsafe there or like I’d be attacked, but rather that the people I encountered weren’t too concerned about my well-being and were always trying to rip me off. Also, the traffic was terrifying, especially when going for a bike ride. I suppose if I do ever find myself in Cambodia again I’d like to explore more of the coast. I didn’t get to any of the islands or the smaller towns, and although the beach at Sihanoukville is beautiful, the town completely lacks culture and charm. 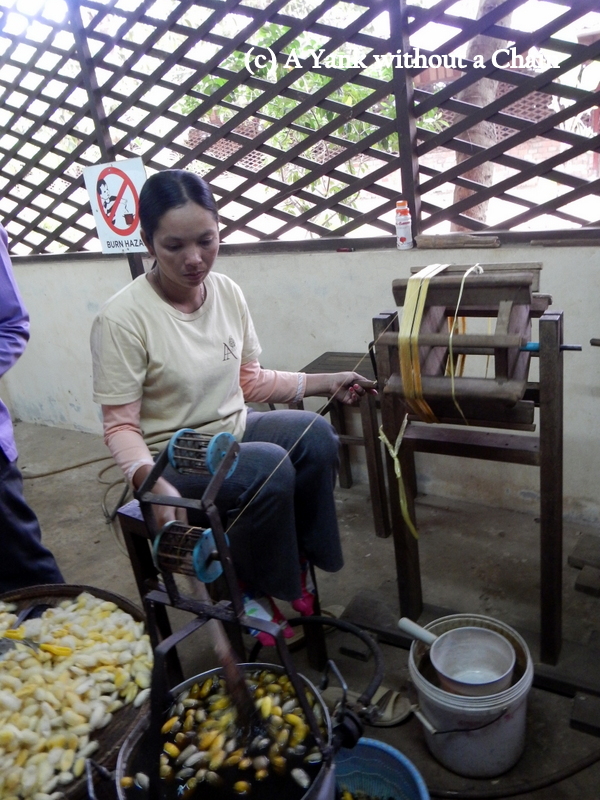 Besides the Angkor Archaeological Park, a main attraction in Siem Reap is the workshops and silk farm of Artisans Angkor. The organization recruits young people from rural areas in Cambodia to create traditional Khmer crafts for sale. It is free to visit both the workshops and the silk farm, and both are worth the time. The silk farm in particular is a valuable experience, as you learn how silk products are made from start to finish. You can’t help but leave with an appreciation for the tedious, time-consuming craft! Of course in both the workshops and the silk farm there is a gift shop where you can purchase the crafts and support the organization. 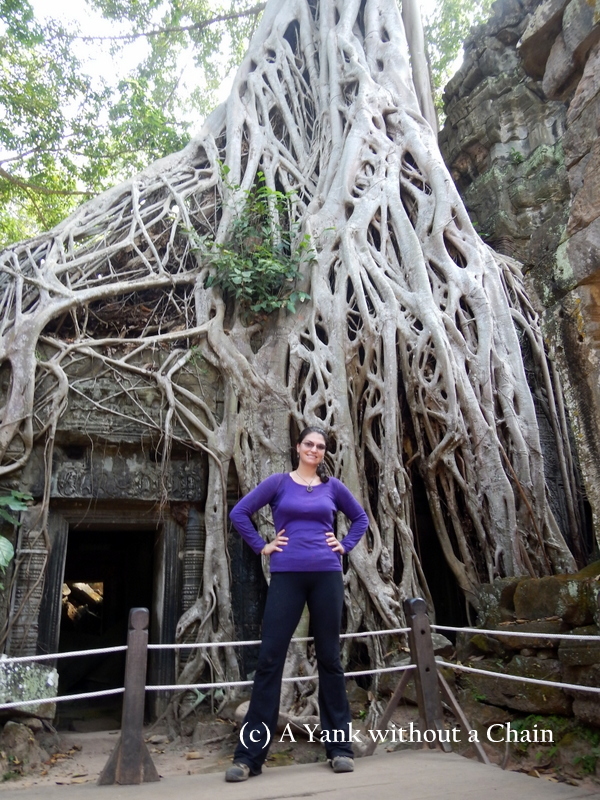 My final day of my tour of Angkor included the temples Ta Prohm and Preah Kahn, both famous for the magnificent trees and vines that grow amongst the ruins. 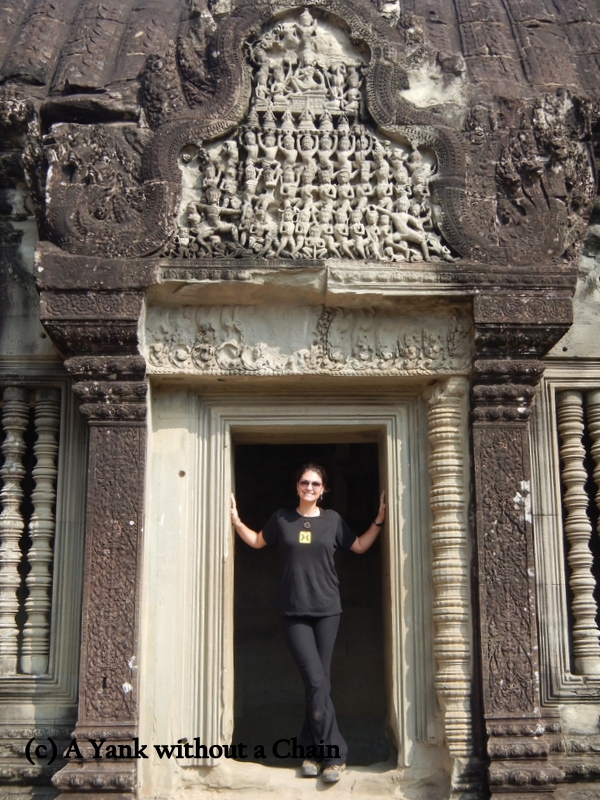 These ruins are also where the Angelina Jolie movie Tomb Raider was filmed. You can definitely see why! It is truly striking to see how the trees have overtaken the sites and it’s a reminder of the power of nature over man. Unfortunately I didn’t get the timing quite right to take great pictures – early morning or late afternoon are best to avoid the sun, and of course I went between 11-2pm, probably the worst time! Over my three days, I didn’t see quite as much of the Angkor Archaeological Park as I had anticipated, but after three days of biking around in the heat and surrounded by huge crowds of tourists, I was ready to move on! It takes a truly dedicated tourist to see more than 5 or 6 of the temples in three days. On my second day visiting the Angkor Archaeological Park, I biked all the way from my hostel in Siem Reap to the ruins of Banteay Srei, nearly 40 km outside of town. It was New Year’s Eve and honestly it was the best way I could have finished out 2013, a year filled with adventures, learning, and growth. 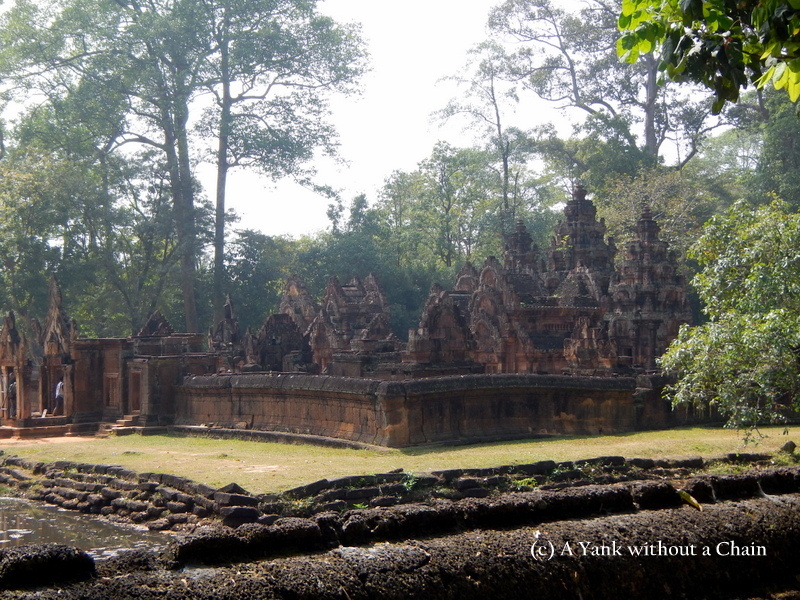 The ruins of Banteay Srei are small but impressive with their well preserved and highly intricate carvings. Built in the 10th century, the ruins pre-date Angkor Wat by about 200 years and it’s believed the temple is dedicated to the Hindu god Shiva. The highlight of my time in Cambodia was definitely Siem Reap and riding a bicycle around the Angkor Archaeological Park. I got the three day pass for $40, thinking that would allow me ample time to see pretty much everything. The park was much, much larger than I anticipated and in actuality I only scratched the surface! My first day I visited the two major sites, Angkor Wat and Angkor Thom, as well as smaller sites like Phnom Bakheng for sunset and Baksei Chamkrong which lies between Angkor Wat and Angkor Thom. It was difficult getting good photos because of the sheer number of other tourists who were trying to get the same photos at the same time, but I did manage to capture some of the details of the places. Once you can ignore the pushiness of both fellow tourists and locals, it’s truly magical to bring yourself back in time over 800 years to think about how these ancient royals lived. For Christmas week I decided to take a break, relax and spend some time at the beach. I didn’t do any sightseeing or hiking, and only took a handful of pictures. Here’s a taste of my holiday! Hope everybody had a great one, too. A green pedicure on the beach for Christmas! A Christmas lunch of Cambodian lobster!